Not only a crafty deception to provide tasty food for astronauts. Over the next years 3D printers may become a household kitchen appliance, helping people save time when preparing meals or adding specific nutritious ingredients to their diet. Several tests are already underway: for four years Barilla, the Italian corporation specialised on producing pasta, sauces and baked products, together with TNO, a research centre in the Netherlands, has been testing additive manufacturing prototypes to produce new shapes of pasta. “After three years of efforts, we have developed our device,” explains Michela Petronio, R&D deputy head at Barilla. “At the moment, it is still a prototype allowing us to print pasta in shapes that otherwise can't easily be replicated. This is important because, you feel differently when eating spaghetti or penne and 3D printing opens a largely unexplored horizon in the field of food design”. The next steps will be about the consistency and balance of different ingredients: “There is still a quite long way to go,” adds Petronio, “but our aim is to consider which applications are the most interesting for our consumers”. Foodini For home equipment, the first appliance on sale may well be Foodini, built by a Spanish company based in Barcelona, Natural Machine, that is hoping to sell it in a limited pre-series by late 2015. This appliance will cost about 1,500 US dollars (1,357 euros) and will have people taking home a machine using common ingredients. “Our aim is to ease the way to prepare homemade healthier food. With an extra bit of fun on top”, says Lynette Kucsma, co-founder and chief marketing officer at Natural Machine. What makes Foodini different is its ability to enable users to print not only one type of food, such as chocolate or sugars, but also to fill capsules with various sorts of ingredients. People can thus extend the range of printable food. Both Barilla and Foodini use the same technology, known as fused deposition modelling (FDM): it consists in setting out ingredients - in the case of Barilla a dough, for instance – and layer by layer, producing a specific shape. Another technique is powder bed printing, which is based on a layer of powder that is ‘wetted’ by a liquid, for example water or fat that functions as a sort of glue composing the food you eat. 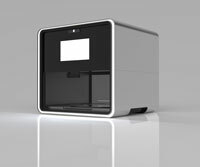 Or the printer can even allow selective laser sintering, a process also used with metals. Starting from a 3D CAD representation, it adds powder layers through laser sintering. The advantages of 3D printed food seem interesting, but not for everybody. Ferran Adrià, the famous chef of the three-star Michelin restaurant El Bulli, in Spain, known for his deconstructivist cuisine and his avant-garde spirit, doesn't seem very keen on having a 3D printer in his kitchen. Our home printer will also allow us to print high protein cookies with worms. It may sound disgusting but, according to UN previews, in the next 35 years the world population will grow to 9.5 billion. Two billion more than today.